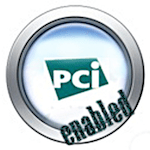 Need to be PCI compliant? CeraNet is PCI enabled and can design solutions to secure your data for PCI compliance. Businesses who accept, store, process or transmit cardholder data are required by credit card companies to comply with PCI standards. PCI security standards are technical and operational requirements set by the PCI Security Standards Council (PCI SSC) to protect cardholder data. CeraNet enables PCI compliance by providing the secure infrastructure (locks, cameras, access restrictions) and by providing the ability to add a hardware firewall separate from the server. CeraNet offers a secure data center infrastructure, engineered network security, and security protocols in place to help you address the requirements of handling confidential information. Solutions that are PCI compliant use cloud computing, dedicated (or colocated) servers combined with our managed firewall / VPN service. CeraNet offers all the physical components you will need to put these solutions in place. We will work with your company to create a custom solution for the maintenance and storage of your confidential data. Contact CeraNet to take advantage of our secure network and technical expertise in addressing PCI compliance. We can help you and your data be accessible, secure, and compliant.